Superman: Secret Identity is being reissued! We wrote about this astoundingly good, real life interpretation of the Superman story here. As it's now out of print it's getting incredibly difficult to find, so we were incredibly excited to find out that it's going to be re-released! 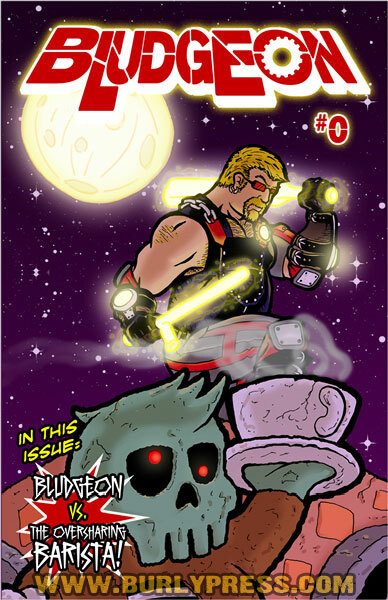 Issue 1 and 2 are reprinted on 19th October and issues 3 and 4 are reprinted on 30th November. As it can be pretty difficult to find second hand copies of this I suggest you snap it up as soon as it's available, because it's a truly great read. It would also make a wonderful present for the Superman/Clark/Lois fan in your life. The first issue of this new comic introduces us to Mike, who is moving to Albuquerque, and it sets up a few mysteries at the same time as portraying a seemingly uneventful enounter at a diner. Our hero is large, gay, and generous, yet carries with him a secret that makes him taciturn around the people he encounters; and the way those people react to him forms as much part of the first issue as his own motivation. He is the alter-ego of a superhero known as Bludgeon. As you'd expect from a title produced by a company called Burly Press, Mike is a bear-identified gay man, and is clearly marked in the author's notes as a self-insert. So as with all good superhero stories, there are two threads we'll be following with this story - one the mystery that brings Mike to Albuquerque, and the other his experiences and personal identification in the gay and bear communities. 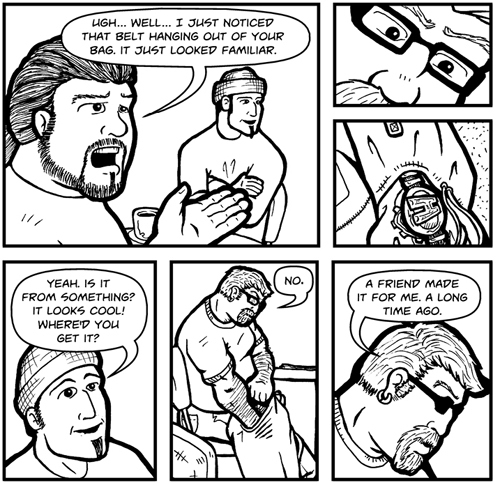 Jeremy Owen really manages to paint the character of Mike in a few simple panels and with sparse dialogue. Mike doesn't talk a lot, but he's polite and quietly amusing when he does, and although we don't get to see a lot of him, it's hard not to like him. The scene in which Owen's sexuality is revealed to the reader is understated on Mike's part, but brutally honest in the reaction of the barista, who may make you squirm as much as I did, in total recognition. "OMG, you're a 'Mo?" she declares excitedly. "I can show you around town! I'll introduce you to my gays! I'm a proud fruit fly." It's not a comfortable scene, but it's familiar, and Mike handles it with understated amusement while waiting for the subject to change. It's just part of the way in which Mike's character and background is introduced. Well, nothing much happens, which is presumably why this is a #0 instead of a #1. The sum plot of the issue is: "Mike is a gay superhero who has moved to Albuquerque following a mystery that's so far taken him across the country." Sure, the way in which we're told these things is well crafted as part of the story, and there's no tedious exposition scenes that are all dialogue, no action, but we're not told anything other than the bare bones. It's not even fair to say that the foundations are laid for the plot. Rather, the lines are drawn on which the foundations will be laid.If you want an action packed plot driven issue, then this isn't where to start. But it certainly looks like action will start, and that it will be a fascinating journey when it starts. And if you want something to whet your appetite before #1 comes out, then #0 is an entertaining read. The biggest drawback, however, would be postage and packing. Being produced by an independent comic publisher, it is only available online and free shipping is only available in the US. Shipping to the UK, for example, is $9 - approximately £5 and more expensive than the comic itself. The art is a black and white line drawing style that works very well with Owens' bold strokes, and the way he can tell a lot about a situation in just one panel. 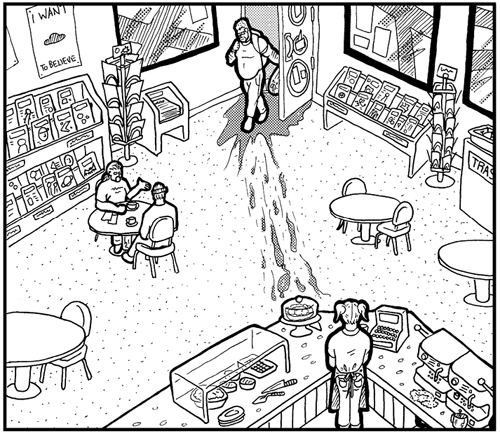 Look at the pattern of traipsed mud on the floor of the diner as Mike enters - emphasising the emptiness of the place and laying the scene. The poster on the wall reflects the conversation we will overhear at the only occupied table in the diner. The characters are clear and varied in the art, and characterisation shines through. There's a level of awkwardness in some of the faces and figure work, but this is the kind of thing I've seen improve very rapidly in comic art, so it's hardly fair to judge Bludgeon on it. All in all, Bludegon is a solid introduction to a promising character. It's quiet, but that's not fully noticeable until you reach the end and wonder "what actually just happened?" If you're looking for independent superhero comics with a wider diversity in characters, this story about a gay superhero in the bear community is a good thing to add to your collection. This is Jeremy Owen's first comic, but if you're interested in other comics with an LGBT cast, check out our LGBT tag. An unusual entry into our review system..
It’s part of the Sneaky VFX comic strip you can find the rest of the their webcomic here. 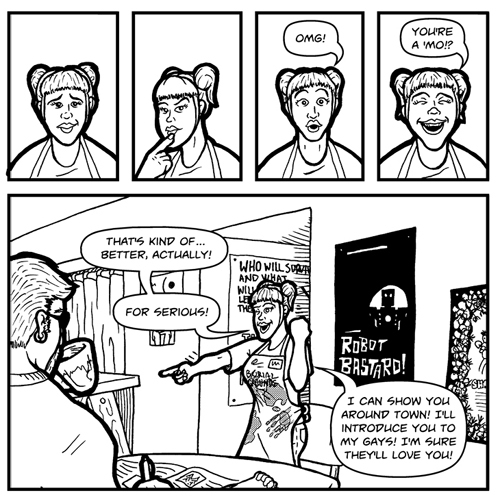 I understand that this is a variation from their usual strips, but based on this entry I heartily recommend you check it out (and forward the link to all teenage girls)! Now, who says comics can’t tackle serious issues effectively? 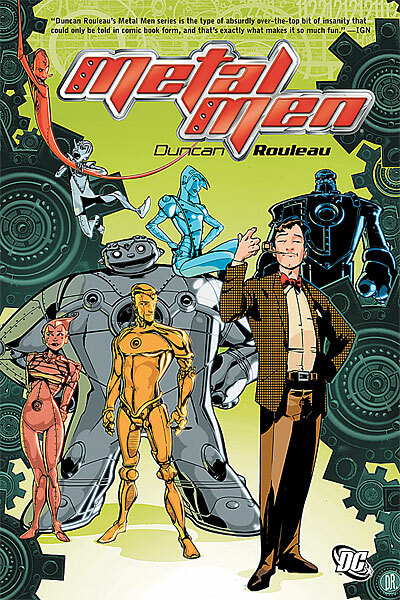 This trade paperback collects the eight issues of the 2007-08 Metal Men mini-series. The Metal Men are a rather obscure team of DC Comics characters. They were originally conceived as a super team of intelligent robots fighting other robotic menaces under the guidance of their creator Doctor Will Magnus during the Silver Age of comics. The Metal Men were then reimagined as fellow scientist (and friends) of Doc. Magnus turned into robots in a freak accident. But the concept sort of felt odd, turning these robots into cheap knock-offs of the Fantastic Four or the Doom Patrol. After that, they weren't much seen anymore for a decade, besides little apperances here and there in other DC books or events. That is were writer Grant Morrison comes in. 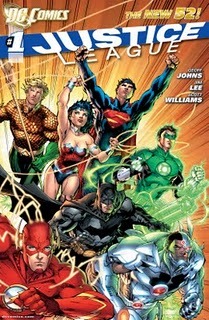 During DC's big yearly story arc 52, narrating a missing year from the perspective of "B and C-lister" type of characters, Morrison decided to give a sub-plot to DC's evil scientists on the imaginary island of Oolong Island. A story in which the Metal Men creator Magnus was abducted by the evil Chang Tzu and forced to work on some top secret projects. After that, Morrison wanted to write a mini-series which would have seen the return of the Metal Men, based upong Magnus' experience from 52 and building up on his own development in that story. Finally, Morrison stepping out for other projects (his work on Batman) DC gave the greenlight for this idea and it was creator Duncan Rouleau who took creative control as both writer and artist for this Metal Men book. 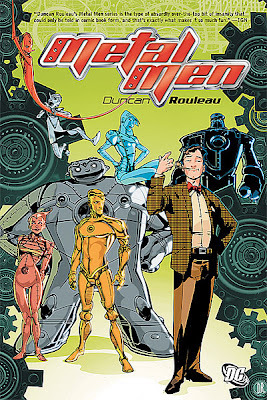 "Metal Men" is both a continuation of Will Magnus as seen in 52 and a reimagining of these characters' origin story. Different names, same basic idea. As popular as they might be in their local birthplace, there's a form of funny books that simply isn't as well documented and known outside their countries' border. European comics. What is known, in various languages, as "Bande dessinée" (literally, "drawn strip") the french term for Franco-Belgian comics. Mostly, they aren't as well represented on the net outside specific regional websites. Perhaps its due to a lack of information regarding them or documentation beside the few high profiles long running series (Tintin, Lucky Luke or Astérix come to mind). 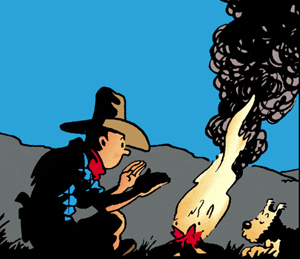 Or the irregular exportations of those few books, try to get a complete run of Spirou in english, at a single editor and on a regular format. So here's a little in-details blog post about European comics, a brief look at their histories, the various editors, the genres and some personal thoughts and recommendations. And if there's some demand, I might review some of these books, some series I'm a big fan of. Regular cover on the left, variant cover on the right. We recommend you buy the regular cover so you can avoid looking at a deformed and pin headed Wonder Woman. The inside of the comic is exactly the same, just the cover is different. It's the introduction to the new DC Universe. 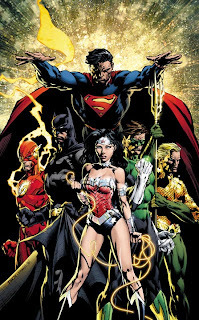 In an attempt to boost sales and attract new readers to their books, DC Comics have recently undergone a relaunch. Lovely, this is just the sort of initiative we approve of at New readers...start here! 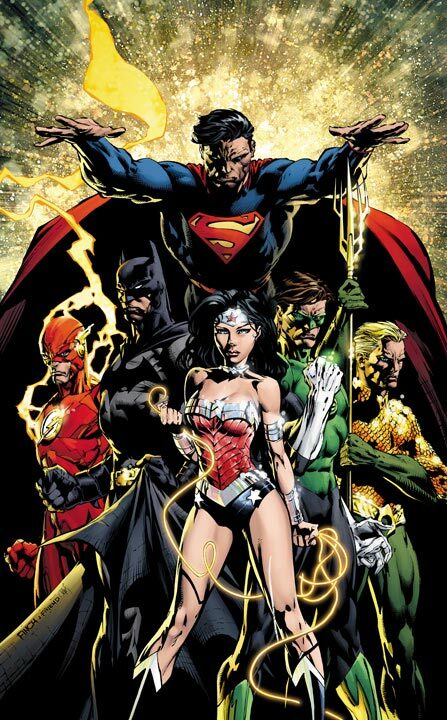 The story is set 5 years in the past, at a time when the Justice League, DC Comics' premier team of superheroes, is just forming. It is part of an ongoing story arc, which will probably be spread out over 5 or 6 issues. This means this issue is just the first part of the story. Apart from that I will tell you nothing else as it's only 26 pages long and I want to avoid spoilers.